If you put in enough hard work and you dream big enough, that dream will come true. The son of NASCAR driver Joe Nemechek, former 1989 All PRO Super Series and 1992 NASCAR Busch Series champion, John Hunter has always had a pretty good grip on the path he would take. Never one to shy away from competition, John Hunter played many contact sports at a young age, but he continued to return to the track. “I always knew I wanted to race,” says John Hunter, “but I just didn’t know what.” It was in 2010 that he switched to stock car competition, moving up to “late model” and “super late model” in 2012. At the age of 15, John Hunter would go on to win 15 of 18 races in the Allison Legacy Race Series, finishing as champion. When John Hunter was 16, he transitioned to the NASCAR Camping World Truck Series. Due to his age, he was only allowed to run ten races a year, but the experience was priceless. 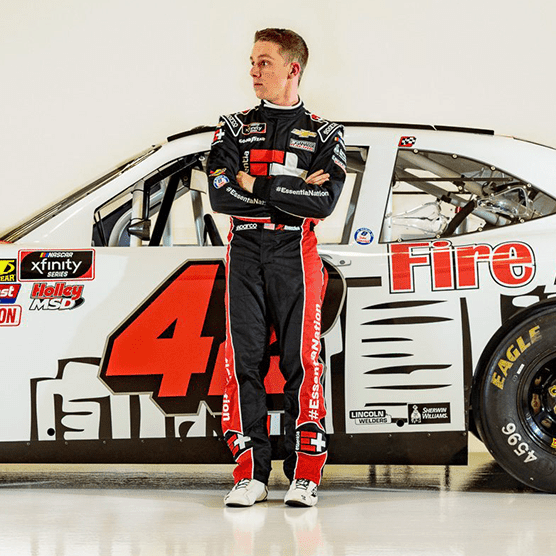 Now 21 years old, John Hunter has entered his second year in the NASCAR Xfinity series as a veteran driver with much of his career still in front of him. Racing week-in and week-out requires preparation. John Hunter pushes himself to the next level with two to three workouts a day, spending the rest of his time in the shop. It’s important “being hands-on and learning everything I can about the car. Everything you can do physically and mentally helps you in a race car.